Abba TruMint Conditioner is a natural treatment created as a daily light-weight conditioner for all hair types. Energizing herbal ingredients combined with the fresh essence of rosemary and peppermint help add body, shine and softness to your hair while controlling tangles and static electricity. 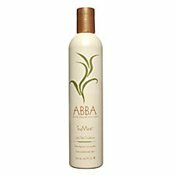 Notify me of updates to ABBA TruMint Conditioner 10 oz.